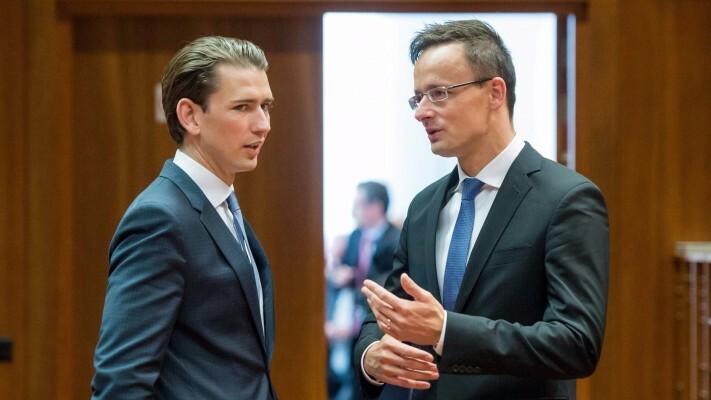 Hungarian Foreign Minister Péter Szijjártó is at odds with his Austrian counterpart, Sebastian Kurz, over whether the European Union should suspend all accession negotiations with Turkey, due to troubling human rights violations, especially since July’s failed coup. The Orbán government has been a staunch supporter of President Recep Tayyip Erdoğan’s Turkey, and Hungarian foreign policy in general has been pro-expansion of the European Union. In contrast, Austria believes that Ankara’s policies are increasingly at odds with European standards of human rights and this must lead to consequences. The Austrian position, as presented by Mr. Kurz, is principled. “The European Parliament has accepted a courageous and appropriate position, according to which all accession negotiations must be frozen,” said Mr. Kurz, noting that since July, tens of thousands of civil servants, judges, soldiers, police officers, opposition politicians and journalists have been arrested and imprisoned–and often based on trumped up charges. Sebastian Kurz (left) with Péter Szijjártó (right). Photo: MTI. In fact, Human Rights Watch has published a blistering report on human rights violations in Turkey since the failed coup. An emergency decree, for instance, has led to the increasingly widespread use of torture on the part of authorities. The document provides details on 13 such cases, showing that sexual abuse, severe beatings and sleep deprivation are increasingly commonplace in police detention. “By removing safeguards against torture, the Turkish government effectively wrote a blank check to law enforcement agencies to torture and mistreat detainees as they like,” writes Hugh Williamson, the Europe and Central Asia director at Human Rights Watch. Hungary’s Mr. Szijjártó, however, does not seem moved by the human rights violations. “Today, Europe’s security starts with Turkey’s stability. As such, we must avoid any irrational decision that may destabilize or that may loosen the connection between the two parties,” said Mr. Szijjártó during discussions on Tuesday in Brussels among the EU’s foreign ministers. Mr. Szijjártó asserts that the EU effectively placed Europe’s security in the hands of Ankara, when it came to an agreement with Turkey on how to handle the refugee and migrant crisis. The Hungarian foreign minister pointed out that Turkey remains a NATO member state and is a critical partner in the fight against terrorism. That view is broadly shared by Germany’s foreign minister, Michael Roth, who warned against “slamming the door” on Turkey at such a critical time. In contrast to Mr. Szijjártó, however, Mr. Roth did make reference to Turkey’s steps backwards when it comes to human right and freedom of the press. Harlem Désir of France, however, suggested a compromise. While France would not support opening up any new EU accession negotiations with Turkey at this time, it would be important to continue with existing talks. Mr. Szijjártó reaffirmed Hungary’s long-standing position about the importance of expanding the EU further into the Balkans, despite the suggestion from Jean-Claud Juncker of the European Commission that no expansion of the EU would take place for at least the next five years. Mr. Szijjártó pointed out that there is greater tension in the Balkans than before and one way to ease potential regional conflicts and avoid them getting out of hand is to essentially keep holding before them the “carrot” of EU membership. Mr. Szijjártó then added, somewhat oddly in light of the Orbán government’s anti-EU rhetoric: “Hungary can only remain strong within a strong European Union. Turning inwards is among the worst possible answers to the challenges that we face,” noted Mr. Szijjártó. Whether President Erdoğan still views EU accession as a priority is up for debate. He is unhappy with the fact that the EU has yet to grant Turkish nationals visa-free travel to the European Union and Turkey seems to be looking to deepening its relationship with Vladimir Putin’s Russia. Mr Szijjártó is only moved when his government’s predatory behavior and human rights violations are documented. Then, he is very outspoken, in defense of the indefensible. The Orbán government is part of the unholy alliance between Russia, Turkey and a growing number of mafia-states around the world. This is the alliance, that America’s Donald Trump and his new Secretary of State will be joining shortly, for the purpose of fattening up their own corporate pockets. Als Staatsminister für Europa ist Michael Roth der politische Stellvertreter des Bundesministers des Auswärtigen Frank-Walter Steinmeier. Well, to get out of this mess that Merkel and Junker caused us with their fucked up migration policy i think he is diplomatically right. We need to pretend we want them to join, but we all know its never gonna happen. Otherwise Erdogan will release 3 million migrants to Europe, does Austria want that? So the Austrian politician is a bloody idiot and he obviously can not play his cards right. Learn some poker mate, start from the basics before you want to become a politician / diplomat…oh God, when do people learn to read between the lines? Europe is meaningless if it doesn’t maintain ethical standards. You should know better than to lie with the devil. Thank you for that article! I just wanted to point to a small mistake in your text : Michael Roth is not German Forreign Minister but “only” Minister of State for Europe at the Federal Foreign Office see http://www.auswaertiges-amt.de/EN/AAmt/Leitung/StMRoth_node.html. Our foreign minister is Frank-Walter Steinmeier. Many thanks for the correction, Sophie.